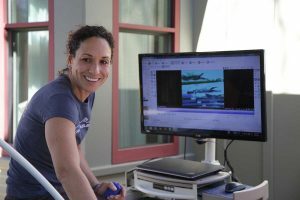 About the Author: Kim Brackin–former Fitter and Faster Swim Tour Coaching Consultant and founder of Brackin Elite Swim Training–has coached swimmers from the ground up. She was the head women’s swim and dive coach for the University of Texas and coached seven Olympians to seven medals throughout the years. As a coach and a parent, I know it is more important for our athletes to understand the process, the journey, rather than merely racking up the wins. While winning is fun, exciting, fulfilling and certainly something to strive for, the characteristics you develop as a person through wins, losses and hours of practice are invaluable. How can we maximize the everyday journey of sport? How do we encourage our athletes to find maximum growth as they pursue their own personal excellence? Today’s student prefers to hear stories that document what they are learning rather than being lectured. They want to be involved in the conversation in order to give their valued opinion. They want to see images that help them process. Lastly, they appreciate when you can keep concepts simple; if you can connect a concept with a tagline they are more likely to understand and remember it. If I think back to the best team meeting or motivational pre/post meet talks, there was ALWAYS a story! I was given an image, through words, to relate to my own situation. I was asked to imagine rather than just being fed someone else’s words of advice. 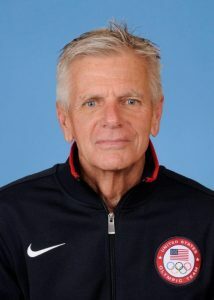 At the 2016 Austin Arena Pro Swim Series I listened in as USA Swimming National Team Coach/Guru, Jack Roach, ended a team meeting with SwimMAC’s Team Elite. The first morning of the meet was a bit rocky and many of the athletes were already letting doubt slip into their minds. Coach Marsh began the meeting with giving advice on how to physically get out of the small rut they might be in and reminded them what he knew they were capable of. Jack finished the meeting with a beautiful story about a boy and his nanny, that he saw walking together while he was on a run. In short, the nanny gave the boy imaginary wings (big huge maple leaves from off the ground) and encouraged the boy to “fly”! Jack related the story as: be a kid again, don’t let anyone, or any one session, clip your wings…do what you believe you can! 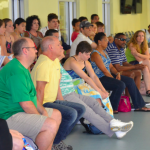 The energy created during his speech was palpable – those athletes connected with Jack’s story and the remainder of their swims that meet showed it! Coach Marsh’s advice was important and necessary, but he enlisted Jack’s gift of storytelling because he knew he needed to connect with his team. Often times, just hearing diverse perspectives will inspire swimmers to do something differently, or allow for an idea to “click”. One of the reasons coaches bring Fitter & Faster clinicians into their team environment is to have experienced and revered athletes reinforce the same skills and ideas that the primary coach has been trying to teach their athletes. In short, it is a great idea to enlist a variety of voices when teaching a skill or inspiring your athletes. As a teacher and/or coach, it is important to be “yourself” but, to be effective, it is important to understand how each of your athletes learns best. Making the time for one on one interaction between athlete and coach establishes a dialog that is engaging and that athletes can relate to. When practicing a specific skill, I make a point of asking the athletes I work with “What were you focusing on or thinking about?, How did that feel?, What do you see?”. This type of dialogue engages them in the learning process. It also allows them to build the confidence that they know what they need and allows them to be able to coach themselves when needed. 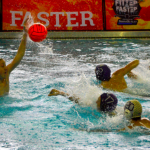 A coach at a traditional swim practice does her/his best to give each athlete valuable feedback but, it is impossible to have eyes on, or communicate with, every athlete all the time. Creating self-sufficient athletes should be a goal of every coach. The more your swimmers know, the more they can teach. As a coach, you should actively seek opportunities for you, and the swimmer, to be exposed to different styles of coaching and a variety of ideas on how to teach and perform technique. 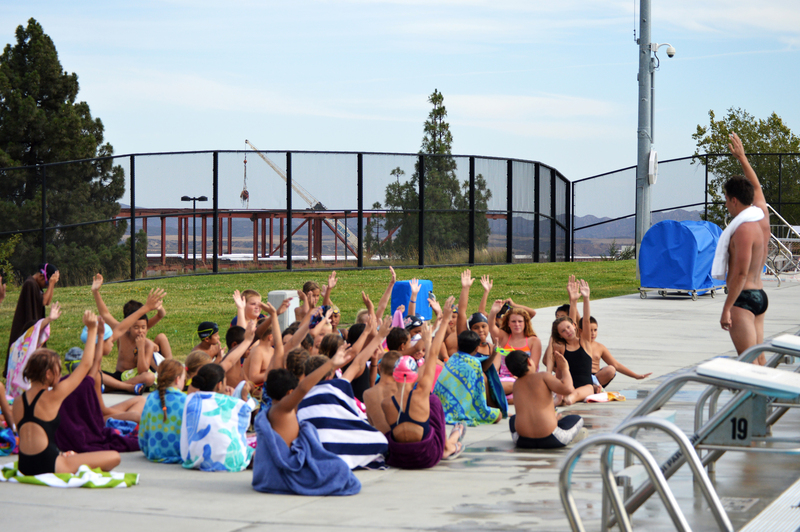 One of the most effective ways to handle a large training group AND instill confidence in your swimmers, is to set up stations where the swimmers peer coach. This atmosphere will allow a coach to float throughout workout, getting valuable time with all the swimmers, as well as using some of the best athletes on the team to teach from a different perspective. We had a very special athlete while I was coaching at Auburn University, Maggie Bowen, who made numerous National Team trips representing the USA; although she was always a medal contender, her coaches weren’t selected to the staff. When we inquired why, we were told, “Maggie knows how to take care of herself so effectively…she doesn’t need you guys!” It was true! We reinforced what her parents and club coach had started: we allowed (and challenged) her to learn what her body needed and how to assess her own performance. I’m sure Mags would have loved having a personal coach with her – just for comfort’s sake – but I’m proud of her for not “needing” it. We challenge you to try not to give your athletes all the answers. Like Dr. Elmore suggests, engage them in the process of learning. When coaching on a traditional pool deck, I loved conducting sets where my athletes had to tell me their time and/or tempo on a pace set rather than waiting for me to give them the information. Ask your athletes to write down what they believe their appropriate meet warm up/warm down is. Ask them to figure out their splits for their goal time. At the end of a challenging set, get the group out, in a circle, and ask each athlete to rate their performance on a scale of 1-5. Make sure kids feel safe in this environment and don’t allow others to ridicule their rating. Find ways to make the athlete an integral part of the coaching process. In this day and age, when young adults are inundated with visual prompts, it makes sense to give them what they respond to best. Take the time to pull out some underwater cameras – it’s as easy as getting a waterproof case for your phone – and get a small snippet of what is happening in the most important spot in our sport…underwater! At the very least, show them a video such as Fitter and Faster’s “Swim Like a Champion” videos that demonstrates exactly what you want your athletes to do. Imitation is a great teaching tool; Showing a swimmer a video of how you would like to see a skill performed and ask them to imitate that – you might be surprised with the results. Using visual ques, versus verbal, takes a lot of the guessing out of the game. KISS – Keep it simple Stu! It is fun to hear ourselves talk but it is generally more effective to give simple, direct and clear instructions, especially in a workout setting. Asking an athlete to focus on one skill rather than a multitude of changes will also lead to more success. You can still work with your swimmer on a comprehensive list of goals they should address, but have individual steps for the process so they can stay on task. All of these exercises ensure that your athletes begin to recognize there is a process to their desired outcome and that they are a part of it. They will become better problem solvers, take more initiative, and you’ll see their confidence grow! Of course, this will require your ability to give up some control, teaching the process beforehand and finding some patience, but that too is part of our coaching job.